Hi! California Classic Propliners is devoted to the Microsoft Flight Simulator simulation of the propliners flying in California, from the DC-3 to the final glory days (before the mid 1970's). Welcome! This page will generally be limited to post-WWII propliners that flew in or into California on a scheduled or regular charter basis, and US carriers will have priority. (I hope others will develop similar pages for other areas and for later /earlier airliners - let me know and I'll set up a link!) I would like to thank everyone who has built, modified, or helped with the planes and other resources on this page. Search the Cal Classic Propliners Site! Most of my (i.e. Greg Pepper's) propliners (i.e. the CV-340, DC's, etc.) have been tested in FSX and P3D v1 and v2 and they work OK. They are not compatible with P3D v3 or later. You may need to find compatible blurred prop textures if you are using FSX SP2 or later. Engine start switches have the most problems when using FS9 panels. Sounds are OK as is. If you get a emergency power warning in the sim, put // in front of the line in the plane's panel.cfg file that includes dsd_supercharger!supercharger_transparent. Compatibility of scenery, etc varies; ask at my forum in case someone has already tested it. Do you need help with installation? How do I get my plane listed properly in the Select Aircraft menu? How do I get ATC to call my plane using the correct airline, manufacturer, and model? Take a look here first! Note: Some of the file downloads are located in the AVSIM and flightsim.com file libraries. You need to be logged in to their file systems before the links will work directly. Are You Just Starting Out Flying Propliners? First, some instructions on using this site. 1. If no text link is provided, click the picture to download it. 2. The main page links are at the top of this page, alongside the "post card". Information on the left side, downloads on the right. Here is a checklist of things you might want to do to maximize your enjoyment. 1. Download and read the FSAviator Propliner Tutorial. It will give you most of what you need to know about flying propliners. 2, If you are using FSX or P3D v1 or v2, read the FSX Propliner Tutorial. This will give you instructions on setting up the views. 3. Download and install any propliner Base Packs. They are listed on my Aircraft Page. 4. Download and install any other airline liveries to the Base Packs. Follow the text files included in the Base Packs to add these textures. Do NOT install complete aircraft when adding to a Base Pack, only add the textures to the Base Pack. 5. Download and install any desired classic airport scenery packages from my Scenery Page. Don't forget to add these as a layer in the Scenery Library. The correct layering of the scenery layers can be found at the top of my Scenery Page. 6. If you installed any classic airport sceneries download and install the FS2004 Custom Scenery Library (files 1 and 2).at the top of my Scenery Page. If you are installing into FSX, also install the FSX version after installing the FS2004 files. 7. If you want worldwide classic AI traffic, download files 1-10 (at least) from my AI Aircraft Page and install them. Follow the instructions in the traffic file download to allow the use of modern traffic when you desire. 8. If you have any problems, head to my Forum. Register and post a question there. Propliner questions should be posted to the main Discussion Forum. If you are interested, keep up with the latest developments right there in the forum. Hope you enjoy flying the propliners! New Scenery! Ken Lawson with Shannon from 1954. New Sceneries! Aaron Seymour again with Adelaide and Hobart in 1962. Updated Liveries! I've updated the American and United DC-7F liveries from Frank Gonzalez! New Scenery! Aaron Seymour has created more airports - Colombo, Ceylon, and Christchurch and Wellington, New Zealand! New Scenery! Aaron Seymour has created Brisbane Eagle Farm in 1965 and Perth Intl. in 1963! Updated Scenery! Tokyo Haneda has been updated by Aaron Seymour! Rome Fiumicino in 1961 from Michael Schneider, Mike Stevens, and Tom Gibson. Mexico City in 1962 from Eduardo Rocha, Tom Gibson, and Mike Stevens. New Tutorial! 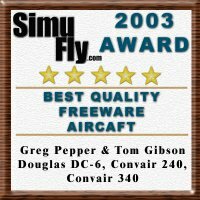 Converting FS2004 Aircraft to FSX format using ModelConverterX. New Scenery! Rio de Janeiro in 1962! Classic Airport Map of the USA. 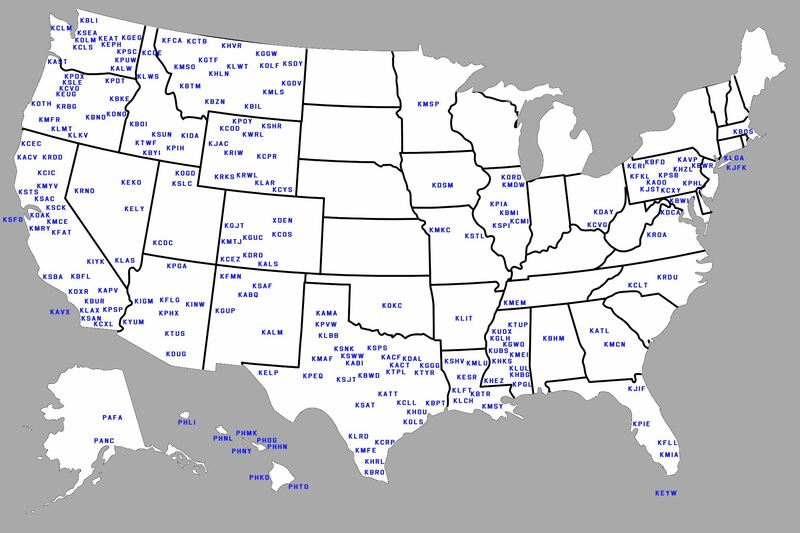 A map of all currently available classic civil airports in the USA. Link is available at the top of my Scenery page. New Scenery! Iceland 1962 by Mike Stevens! New Scenery! Cyprus 1962 by Mike Stevens! New Scenery! Acapulco Mexico by Jorge L. Rechani! Updated Scenery! Wolfgang Gersch has updated his 1962 Jakarta Kemayoran scenery! New Scenery! Wolfgang Gersch has created Macon, GA and Warner Robins AFB! New Scenery! Al Courtney, Kenny Fox, and I have created Miami in 1962! Updated Scenery! Mike Stevens has updated my LaGuardia 1959 scenery! Casey Brasel has created an FSX version! Updated Scenery! Mike Stevens and I have updated our California 1959/1962 scenery! Updated AI Traffic! Mike has also created a minor update to the AI traffic! New Scenery! Ushuaia Argentina 1962 by Mike Stevens! The Frank Gonzalez Memorial Repaint Collection is born! The Super Constellations are available first. New Scenery! Recife Brazil in 1962 from Wolfgang Gersch and Harry Biard! New Scenery! Chris Helton has created version 2 of Washington National Airport! New Scenery! Mike Stevens and I have created Prestwick airport in 1962! FSX Scenery! Karachi Pakistan converted by Casey Brasel! Nice, France conveerted by Casey Brasel! Aircraft Update! An Operations Update for the Jens Kristensen Douglas DC-4! C. Czarnecki has created Pennsylvania Airport Scenery Vol. 1! Finlay Fraser has created Basra Maquil and Abadan! New Scenery! Pacific Northwest 1960 scenery version 2 is here! New Scenery! Buenos Aires Ezeiza airport from 1961 by Harry Biard, Alejandro Ramirez, Jaap de Baare and Wolfgang Gersch! New Scenery! Athens, Greece airport from 1962! AI Traffic Update! New liveries and airlines! GA traffic updated too! New Scenery! Tunis El Aouina airport in 1960 from Michael "Sabi" Schneider, Wolfgang Gersch, Harry Biard and Tom Gibson! New Plane! Milton Shupe and others have created a Lockheed L-18 Lodestar for FS2004 and FSX! New Scenery! The 1961 Bordeaux Merignac airport (LFBD) has been updated to an FSX/P3D version! New Scenery! Alejandro Ramirez and others have created Grenoble Mermoz in 1963! New FSX/P3D Classic Library mega pack using DDS textures! Conversion by Alejandro Ramirez. CalClassic Propliners has received the Editor's Choice Award from FS Magazin! FS Magazin is a German magazine that publishes information about the latest FS news and releases, along with in depth articles on many aspects of Flight Sim. There will also be an article about this site in the June 2015 issue, when released. I am honored that our community has been chosen for this award! New Scenery! Juan Antonio Martinez Castro has created Melbourne and Brasilia airport scenery. Brasilia city scenery too! New Scenery! Mike Stevens and I have created version 7 of the California 1959/1962 project! 1962 Oklahoma City airport scenery from Dan French! 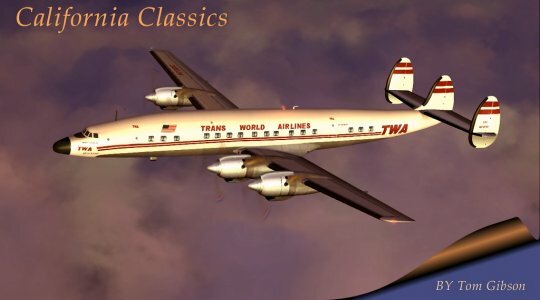 Classic Libraries for FSX now available! Install the FS2004 version, then the FSX update. Tutorials Updated! The FSX Mini-Tutorial has been updated with new information about cfg settings with widescreen monitors, the Repainting Tutorial has been updated with new techniques for using DXTBmp, and the Sketchup Tutorial has been updated to use the latest version of the Material Editor in ModelConverterX. There is also a new tutorial on changing multiple colors at once using PSP 7.0. BTW, if you haven't read FSAviator's Propliner Tutorial, please do it now! Custom Scenery Library. This file (175MB) contains almost all addon scenery libraries needed by our classic sceneries. Once this is installed, you can normally ignore the "download and install these scenery libraries" advice in the text files. System 7 users - when adding scenery to the Scenery Library, after finding the new scenery's folder and clicking OK, you will need to right click the empty white space in that box so the box closes and the new scenery is actually be added to the library. Classic Era Charts now available! Thanks to several generous people we now can see how the airlines flew into various airports back in our era. There are also airport diagrams available! New Tutorial! FSAviator has created a vintage flying tutorial, for aircraft like the Ford Trimotor! It also includes a flight dynamics tweak for the Trimotor! New Tutorial Quick Reference File! FSAviator and I have created a Quick Reference guide for use when actually flying an airliner route, using the techniques explained in his tutorial (below). However, you must have read and understood the entire tutorial first before you will be able to use the quick reference file. This is an exhaustive tutorial that takes you through the details of each phase of flight, and comes complete with approach plates for visual aids (Adobe Acrobat required to view/print approach plates). The complete tutorial is 1.1 MB. I printed it, read it, and now keep it by my computer for ready reference! Copyright FSAviator July 2004. The California Classic page has a new home! We've moved into our new home - www.calclassic.com, and I hope that you like it. The Classic Airliner Page has become the California Classic Propliners page! Same address as below. Instructions for many problems and how to install aircraft, panels, and sounds here. Hi! I'm Tom Gibson, and I hope you enjoy my page. If you have any questions, don't forget to check the Instructions first!! You can get many questions answered by leaving a message at the California Classic Forum (propliner questions) or the FreeFlight Forum (aircraft design questions). You can also send me email - this is a despammed address - remove the first t from the address!! My other interests include railroads (especially Alco diesels and the WP), computers, camping, fly fishing, and Modoc County (far northeast California). Drop by again - soon!